This 2.5 hour private walking tour through Washington DC’s most popular sites will introduce you to the wars and presidents that have helped shape the United States. 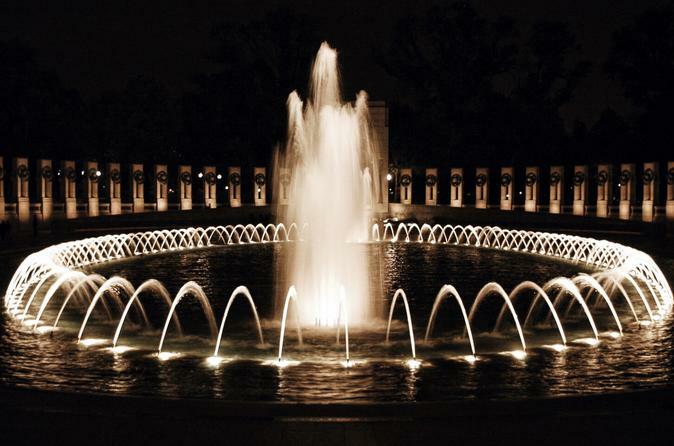 Explore the city at night when the monuments are illuminated to perfection. The tour, led by one of our young expert guides, is the ultimate evening activity for your private group. Washington DC has a vast collection of outdoor monuments in addition to its stellar museums. This evening tour is the best way to visit DC’s iconic sites, including the White House. We’ll explore the history of the nation’s capital as well as the monuments and memorials of the National Mall that feature figures like George Washington and Abraham Lincoln. Your engaging guide will share the stories about the major players and events in American history that have earned memorials on the Mall, including the Korean War, World War II, and Vietnam. They’ll even divulge the intricate symbolism woven into these structures. You’ll be treated to many photo opportunities along the way, so keep your camera handy.